This eight-day adventure takes you off the beaten path into the wild and unspoilt beauty of North Vietnam. During the trip, accompanied with a local guide, you'll trek through mountains, valleys and villages to discover the landscapes and cultures of Sapa and the frontier region of Ha Giang before winding up in the sublime setting of Ba Be National Park. Trek through terraced rice fields from Lao Chai to Ta Van Village belonging to the Giay ethnic minority community, share cultural experiences with the families that live in the area. Trek through the immense scenery to the Red Dzao village of Ta Phin to contemplate the stunning mountains laced with terraced rice paddies. Visit Chang village, Tay ethnic minority community to enjoy the beautiful scenery of the mountainous area, with hills covered with palm trees. Visit the astonishing Palace of the H’mong King, Dong Van Market. Pass to the French Fortress of Pu Lo, the magnificent Ma Pi Leng Pass, through a gigantic maze of lime peaks, stone forests, and canyons. Venture into the valley of Meo Vac. Discover the magnificent Ban Gioc Waterfalls, Nguom Ngao Cave, one of the most spectacular grottos in Vietnam. Journey along Ma Phuc Pass on the way to Ba Be National Park, explore Ba Be Lake, the caves of Puong Grotto, the rapids of the Dau Dang waterfall, Widow Island, and Hua Ma Cave. We started at Hanoi and headed for Sapa, our first stop and then headed onwards for the next 8 days following the itinerary set out. We stayed in various home stays and hotels that were prefixed by the company. Some were more authentic than others but all provided a wonderful host service and the food was excellent at each place. Our Tour guide Linh spoke excellent english and is highly informative in all areas. Linh knowledge of his country was second to none (this may have something to do with him also being a history teacher) and he was always happy to take the time to share all the information with us, from the local food that he would source out for us (we ate delicious food for the 10 days due to Linh and Bao knowing the best places to eat) to history of the caves, lakes, rice fields, minority people and their traditions and so on. An excellent tour guide that exceeded all our expectations. Linh takes exceptional care of his clients and provides you with a great sense of care while never over stepping his professional role – a fine balance indeed for a tour guide and someone you are sharing 10 days with that you had never met before. While we met other travellers along the way with other tour guides, each had complained about their tour guide for one reason of another, so we understood how lucky we were to have Linh, who clearly outshone the other guides. Ling knows his job extremely well and we were very thankful for this. Our driver Bao, is an exceptional driver who knows his job very well. Bao knows how to drive to ensure his clients felt safe (which we did) at all times even when the roads and routes were very tricky. Throughout the trip, we can sincerely say that Ling and Bao made our time so much more special! If you ever find yourself in Hanoi I would highly recommend anyone to book Linh and Bao for a trip up north. The impressions we gained were beyond what we imagined. Any wishes and requests concerning our tour were answered and catered for and we felt safe and welcome the whole trip. A great experience in many ways: culinary, scenically, culturally and personally. 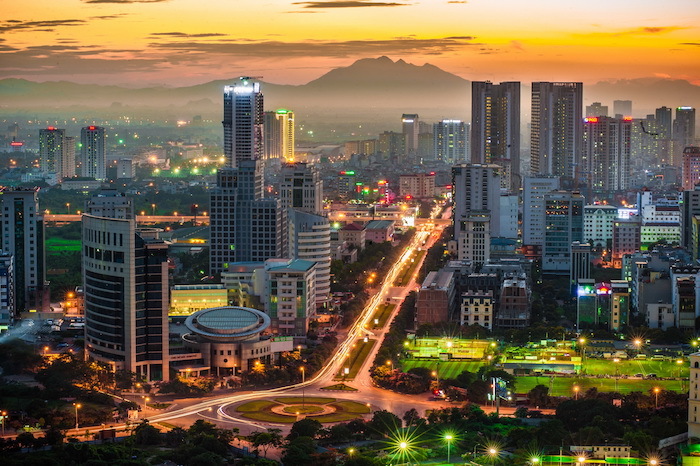 A big recommendation for anyone who is looking to get to know Vietnam off the beaten track. 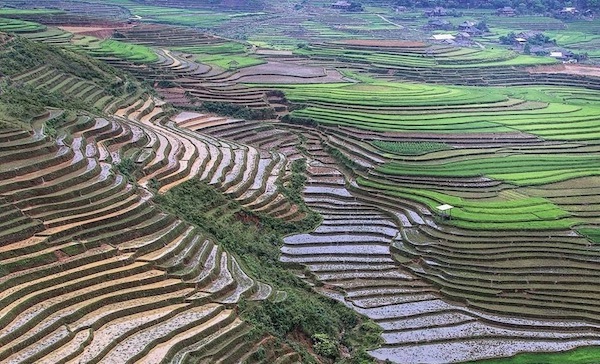 We chose the 7 night "Off the beaten track" tour of North Vietnam and had a great trip. We saw and experienced so much, and the whole experience was simply amazing. We had a really good guide, Mr Long, his english skills, local knowledge, humour and kindness made our tour the absolute highlight of our trip to Vietnam. There is a lot of driving on this trip, but the views make it worthwhile, and there's no other way to get to these places. Our driver Mr Thang was really safe and pleasant company and we always felt safe even on the windy mountain roads with vertiginous drops! You’ll leave Hanoi at approximately 07:30 for the 5-hour drive to Sapa. You can relax and enjoy the marvellous scenery on the journey. You’ll arrive in Sapa around midday where you’ll stop for lunch. You’ll then trek through terraced rice fields from Lao Chai to Ta Van Village which belongs the H’mong community. In the village, you have the opportunity to meet the local people and get to know them, how they live and about their history, before you travel back to Sapa Town by car to your hotel. 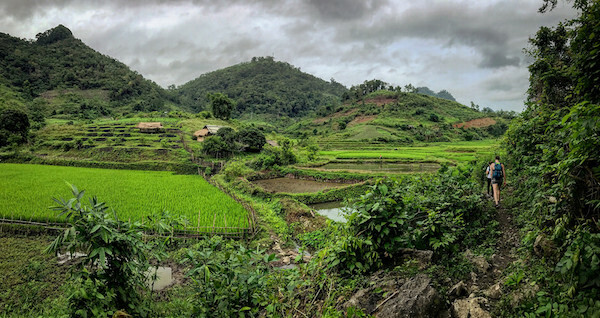 At around 08:30, after breakfast, you’ll begin the trek to the Red Dzao village, Ma Tra followed by Ta Phin Village, passing through the incredible scenery of the rice paddies and small villages along the way. You’ll spend the night in a local homestay where, putting you at the heart of local culture, you’ll share a hearty dinner with hosts and spend the night in their home. 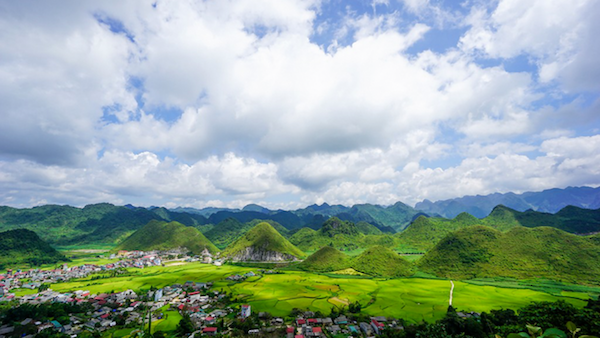 Today you venture into the wild landscapes of Ha Giang stopping over at the Cat King’s House, Hoang A Tuong, in Bac Ha town and Chang Village, inhabited by a Tay community. Enjoy the beautiful scenery of the mountainous area, dotted with forests and an abundance of wildlife. You’ll continue the journey to Ha Giang, arriving at around 18:00. On arrival, you’ll visit a nearby Tay village, where you’ll have dinner and spend the night in a family owned stilt house. Once we have purchased the mandatory permit at the Immigration Office, you’ll begin the journey to Dong Van following a spectacular series of passages which wind through the mountains and valleys. En route you enjoy exceptional views of the rolling landscape and fascinating flora and fauna. After that, you’ll have lunch in the small mountain town of Tam Son visiting the local villages of the H’mong, Pho Bang, Pho Cao. You’ll have the chance to see the former palace of the H’Mong King, Vuong Chinh Duc who was an ally of the French. You’ll arrive in Dong Van around 18:00 where you’ll have dinner at a local restaurant and spend the night in theHoa Cuong Hotel. Starting with a visit to the market in Dong Van (Sunday morning), where the locals shop for all their home cooking supplies, clothes and homewares. We then climb a pass up to the French Fortress of Pu Lo, which was built in 1890 and vacated in 1945. The views from here of the entire region are truly spectacular. 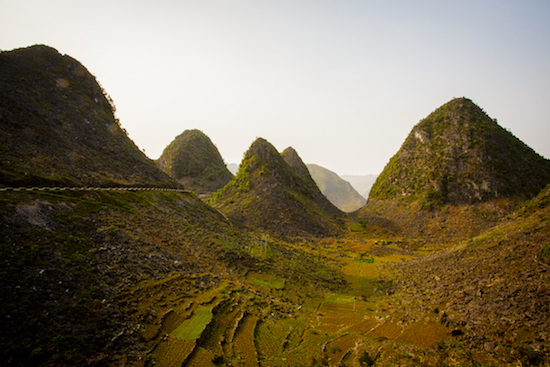 We then continue onward on a climb of 15 km up to the top of the Ma Pi Leng Pass, through a maze of lime huge peaks, which look almost like ‘stone forests’, and canyons the like of which you’ll not see anywhere else in the world. You then head down into the valley of Meo Vac before winding through the mountains and across the river to arrive in the village of Bao Lac. 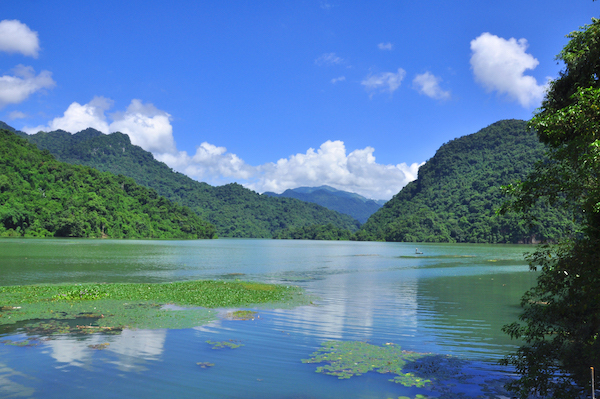 Here you’ll have lunch and then take the mountain road from Bao Lac – Cao Bang. At this point you’ll have some free time to relax, rest and unwind, spending the night in the Sunny Hotel. One of the most scenic roads in Vietnam arrives at the magnificent Ban Gioc Waterfalls, the closest you can get to the Chinese border: which passes right through the middle of the falls. Before arriving to the waterfalls, you’ll visit one of the most spectacular grottos in Vietnam, Nguom Ngao, which counts several kilometers of superbly-lit cave systems and not to mention another 100-m cave. 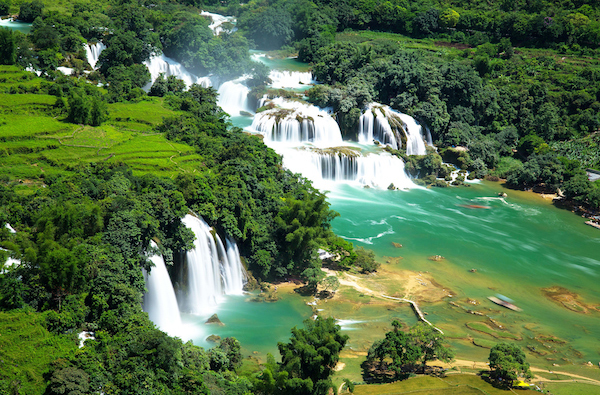 You’ll then arrive at the extraordinary site of the Ban Gioc waterfalls. These are divided between Vietnam and China, half in each. You’ll briefly head over to the China side of the river on a bamboo boat and have lunch in a local restaurant. You’ll then visit some traditional villages of forged, incense, tile, meeting the locals and learning about their trade. You’ll then return the same way to Cao Bang for diner and overnight at Nung house in Quang Uyen. Today you’ll go through Ma Phuc pass and continue to Ba Be National Park for a boat ride along the Nang River, with time to explore Ba Be Lake, the caves of Puong Grotto, the rapids of the Dau Dang waterfall and tiny Widow Island. You’ll also visit the stilt houses of the Tay community in Coc Toc Village, where you’ll spend the night in a homestay. After breakfast, you’ll stroll along the riverfront, visit some lovely local villages and hike the upper reaches of the lake, in an area marked by massive limestone cliffs and mountains. And then there’s time to visit the Hua Ma cave, the biggest dry cave in Northeast Vietnam. You’ll then have lunch in a local restaurant, before beginning your journey back to Hanoi, arriving there at around 5pm. (Meals included: breakfast and lunch).